Countless travelers have stayed at Fjærland Fjordstove Hotel & Restaurant to witness the beauty of the surrounding countryside. Yet, this interest is a recent development, as the hotel’s home of Fjærland spent many centuries beforehand as an isolated agricultural village hidden away within the towering, mountainous terrain of Sognefjord. Its residents lived by simple means, leaving much of the local geography untouched. When access to Fjærland improved dramatically during the 20th century, interest in visiting this unspoiled landscape proliferated throughout the world. 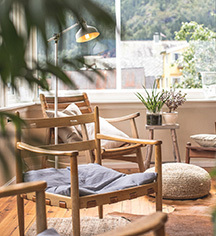 Originally constructed as a guesthouse some fifty years prior, owner Brad Huesby debuted the Fjærland Fjordstove Hotel & Restaurant during the 1980s to cater to this new popularity. This fantastic boutique hotel now ranks among the country’s most popular destinations, allowing for its guests an amazing opportunity to experience the region’s historical, bucolic charm. Fjærland Fjordstove Hotel & Restaurant is one of western Norway’s most enjoyable vacation getaways. This seasonal hotel is open from April until the end of September and features 14 incredible accommodations that each possess their own incredibly unique character. Embracing the country’s famous rustic ambiance, these spectacular spaces offer stunning views of the neighboring countryside. Guests will also experience the true essence of authentic Nordic cuisine when dining at Fjærland Fjordstove Hotel & Restaurant. The hotel’s incredibly talented culinary team has crafted a brilliant range of traditional Norwegian fare that truly brings the culture of the area to life. And its amazing staff are more than happy to help arrange for excursions out into the countryside, regardless of whether it involves hiking, skiing, or something else entirely. 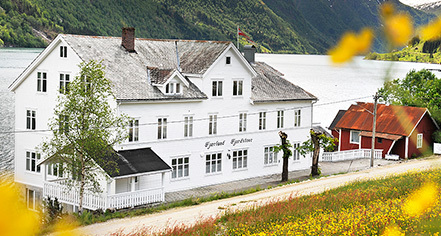 Fjærland Fjordstove Hotel & Restaurant, a member of Historic Hotels Worldwide since 2018, dates back to 1937. The Fjærland Fjordstove Hotel & Restaurant is located in Fjærland, which it itself resides on an upper branch of western Norway’s spectacular Sognefjord. This fjord is part of the area's UNESCO World Heritage Site known as the West Norwegian Fjords. Age Requirements: There are no age requirements for check-in. Cancellation Policy: Varies according to rate or room type. Deposit: Credit card guarantee required at time of booking. For non-refundable prepaid rates, full payment due at time of booking. Eco-Friendly Practices: Since spring 2015 the hotel has been certified as an Eco-Lighthouse, Norway’s widely used environmental management system. Extra Person Fees: Extra bed or crib is NOK 250 per night. Occupancy Restrictions: Varies by room type. The maximum number of extra beds in a room is 1. Payment: Visa, MasterCard, Amex, debit cards, and cash are accepted. Pet Policy: Pets are allowed; specific rooms only and restrictions apply. Pet-friendly rooms can be requested by contacting the property at the number on booking confirmation. Shuttle Service: Service to and from the airport may be scheduled through the resort's concierge. Rates apply. Countless travelers have stayed at Fjærland Fjordstove Hotel & Restaurant to witness the beauty of the surrounding countryside. Yet, this interest is a recent development, as the hotel’s home of Fjærland spent many centuries beforehand as an isolated agricultural village hidden away within the towering, mountainous terrain of Sognefjord. Learn more about the History of Fjaerland Fjordstove Hotel & Restaurant .